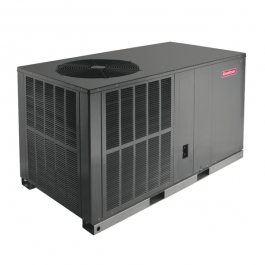 The Goodman GPC13M Packaged Air Conditioner provides energy-efficient cooling performance in one self-contained unit. This unit is suitable for ground-level or rooftop installations and provides value and indoor comfort to homeowners and small businesses while helping to lower energy bills as compared to lower SEER units. 1 Does the unit have gas heat and electric air conditioning? Answer Hello Chad,This unit is cooling only.Please feel free to contact us at 888-474-9966 with any further questions. 2 Does the unit come filled with freon? Answer Hello Chad,This unit is dry-charged but this unit is longer available it has been discontinued by the manufacturer.Please feel free to contact us at 888-474-9966 with any further questions.